The following snippet shows a simple Map and the necessary Plugin type to use it. 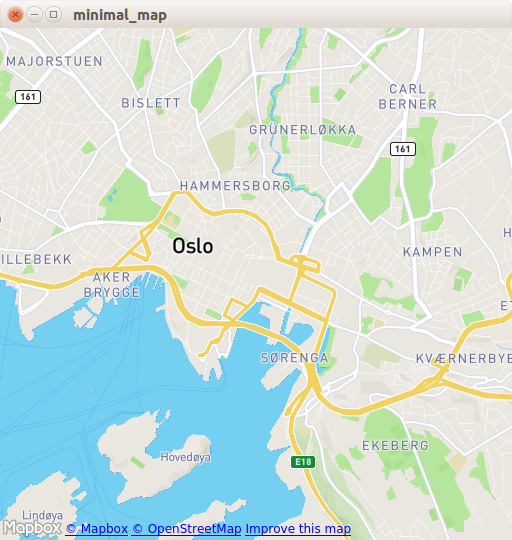 The map is centered over Oslo, Norway, with zoom level 14. This property holds the bearing for the map. The default value is 0. If the Plugin used for the Map supports bearing, the valid range for this value is between 0 and 360. If the Plugin used for the Map does not support bearing, changing this property will have no effect. This QML property was introduced in Qt Location 5.9. This property holds the background color of the map element. This property holds the visibility of the copyrights notice. The notice is usually displayed in the bottom left corner. By default, this property is set to true. Note: Many map providers require the notice to be visible as part of the terms and conditions. Please consult the relevant provider documentation before turning this notice off. Map.NotSupportedError -The maps plugin property was not set or there is no mapping manager associated with the plugin. This property holds the field of view of the camera used to look at the map, in degrees. If the plugin property of the map is not set, or the plugin does not support mapping, the value is 45 degrees. Note that changing this value implicitly changes also the distance between the camera and the map, so that, at a tilting angle of 0 degrees, the resulting image is identical for any value used for this property. For more information about this parameter, consult the Wikipedia articles about Field of view and Angle of view. See also minimumFieldOfView and maximumFieldOfView. Returns the list of all map parameters in no particular order. These items include map parameters that were declared statically as part of the type declaration, as well as dynamical map parameters (addMapParameter). See also MapParameter, addMapParameter, removeMapParameter, and clearMapParameters. This property holds whether the map has been successfully initialized and is ready to be used. Some methods, such as fromCoordinate and toCoordinate, will not work before the map is ready. Due to the architecture of the Map, it's advised to use the signal emitted for this property in place of Component.onCompleted, to make sure that everything behaves as expected. This property holds the maximum valid field of view for the map, in degrees. The minimum tilt field of view by the plugin used is an upper bound for this property. If the plugin property is not set or the plugin does not support mapping, this property is 179. See also fieldOfView and minimumFieldOfView. This property holds the maximum valid tilt for the map, in degrees. The maximum tilt defined by the plugin used is an upper bound for this property. If the plugin property is not set or the plugin does not support mapping, this property is 89.5. See also tilt and minimumTilt. The maximum zoom level is defined by the plugin used. If the plugin property is not set or the plugin does not support mapping, this property is 30. This property holds the minimum valid field of view for the map, in degrees. The minimum tilt field of view by the plugin used is a lower bound for this property. If the plugin property is not set or the plugin does not support mapping, this property is 1. See also fieldOfView and maximumFieldOfView. This property holds the minimum valid tilt for the map, in degrees. The minimum tilt defined by the plugin used is a lower bound for this property. If the plugin property is not set or the plugin does not support mapping, this property is 0. See also tilt and maximumTilt. The minimum zoom level defined by the plugin used is a lower bound for this property. However, the returned value is also canvas-size-dependent, and can be higher than the user-specified value, or than the minimum zoom level defined by the plugin used, to prevent the map from being smaller than the viewport in either dimension. If the plugin property is not set or the plugin does not support mapping, this property is 0. This property holds the tilt for the map, in degrees. The default value is 0. The valid range for this value is [ minimumTilt, maximumTilt ]. If the Plugin used for the Map does not support tilting, changing this property will have no effect. See also minimumTilt and maximumTilt. Larger values for the zoom level provide more detail. Zoom levels are always non-negative. The default value is 8.0. Depending on the plugin in use, values outside the [minimumZoomLevel, maximumZoomLevel] range, which represent the range for which tiles are available, may be accepted, or clamped. Adds the map items contained in the given itemGroup to the Map (for example MapQuickItem, MapCircle). See also MapItemGroup and removeMapItemGroup. Adds itemView to the Map. See also MapItemView and removeMapItemView. Adds a MapParameter object to the map. The effect of this call is dependent on the combination of the content of the MapParameter and the type of underlying QGeoMap. If a MapParameter that is not supported by the underlying QGeoMap gets added, the call has no effect. See also MapParameter, removeMapParameter, mapParameters, and clearMapParameters. Aligns coordinate to point. This method effectively extends the functionality offered by the center qml property, allowing to align a coordinate to point of the Map element other than its center. This is useful in those applications where the center of the scene (e.g., a cursor) is not to be placed exactly in the center of the map. If the map is tilted, and coordinate happens to be behind the camera, or if the map is not ready (see mapReady), calling this method will have no effect. The release of this API with Qt 5.10 is a Technology Preview. Clears map data collected by the currently selected plugin. Note: This method will delete cached files. Removes all items and item groups from the map. See also mapItems, addMapItem, removeMapItem, addMapItemGroup, and removeMapItemGroup. Removes all map parameters from the map. See also MapParameter, mapParameters, addMapParameter, removeMapParameter, and clearMapParameters. Fits the current viewport to the boundary of all map items. The camera is positioned in the center of the map items, and at the largest integral zoom level possible which allows all map items to be visible on screen. Fits the current viewport to the boundary of all visible map items. The camera is positioned in the center of the map items, and at the largest integral zoom level possible which allows all map items to be visible on screen. If cliptoViewPort is true, or not supplied then returns an invalid QPointF if coordinate is not within the current viewport. Removes itemGroup and the items contained therein from the Map. See also MapItemGroup and addMapItemGroup. Removes itemView and the items instantiated by it from the Map. See also MapItemView and addMapItemView. Removes the given MapParameter object from the map. See also MapParameter, addMapParameter, mapParameters, and clearMapParameters. Sets the bearing for the map to bearing, rotating it around coordinate. If the Plugin used for the Map supports bearing, the valid range for bearing is between 0 and 360. If the Plugin used for the Map does not support bearing, or if the map is tilted and coordinate happens to be behind the camera, or if the map is not ready (see mapReady), calling this method will have no effect. If cliptoViewPort is true, or not supplied then returns an invalid coordinate if position is not within the current viewport.